What is the difference between footnotes and endnotes? The only difference between footnotes and endnotes lies in their position. The text of footnotes sits at the bottom of the page on which the footnote is referenced. The text of endnotes sits at the end of the chapter, article or even the whole book in which the footnote is referenced. What do endnotes look like? Unlike footnotes, which can use symbols or numbers, an endnote will usually be marked using a raised number after the bit of text that they refer to, like this.1 The reason for this is that a whole set of endnotes might appear at the end of a chapter or book, and there aren’t enough symbols to cover more than about five. The text of the endnote will be marked with the same number, and will include all of the text that you want to appear outside the main text. Endnotes at the end of a chapter will usually start at 1 for each new chapter. However, endnotes for an entire book might be numbered either starting at 1 for each new chapter or running sequentially through the whole book, running into the hundreds. Sometimes endnotes don’t have a number in the text, but just refer in their own text to a section of the main document. These tend to be done by hand rather than automatically in the way I’m going to show you today. 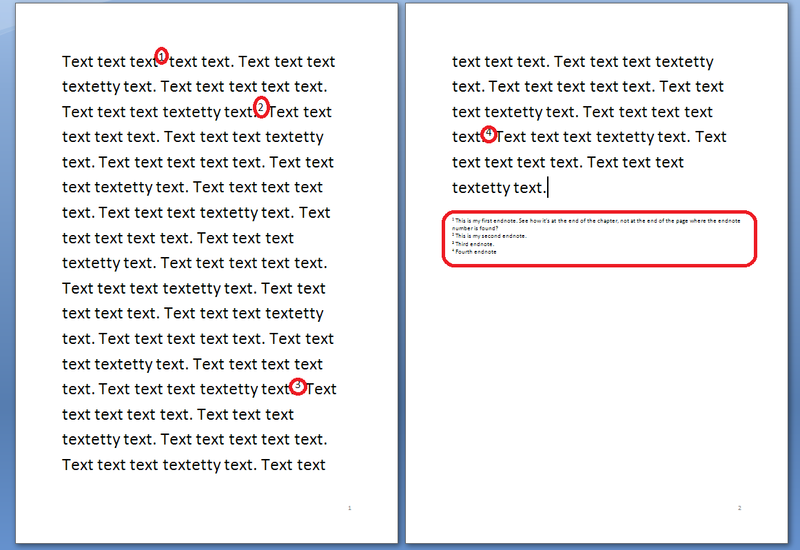 How do I create an endnote in Word 2007 and Word 2010? This will bring up your endnote options. Choose your options (see next section) and when you press Insert, a number will appear in your text, and an endnote number will appear right at the end of your document (or chapter), ready for your endnote text. Type the text you want into your endnote field, noting that you can change the paragraph style, size and font as with any text, although it’s common for the endnote font to be smaller than the main document font. To insert the next endnote, follow the same sequence, although once you’ve set up your options, you can just hit the Insert endnote button instead of dropping down the options. How do I delete an endnote? Using the automated endnote system means that the numbering will adjust itself to stay correct if you delete and move notes around. Don’t highlight the endnote itself and delete it. This has no effect on the numbering. 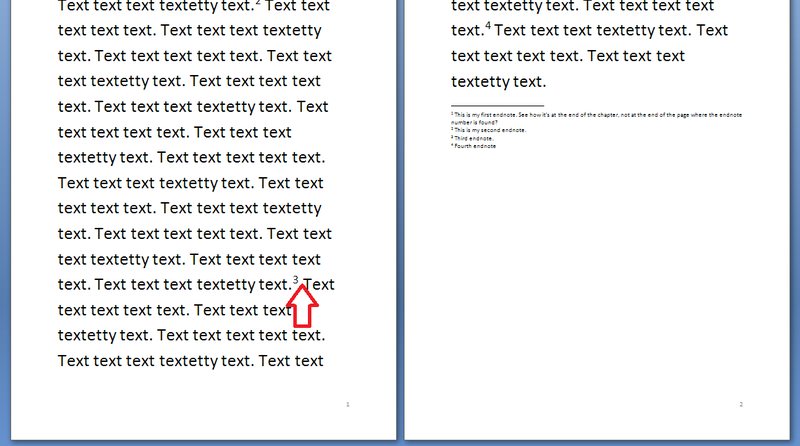 Instead, highlight the number in the text or position your cursor at the point just after it and press delete. 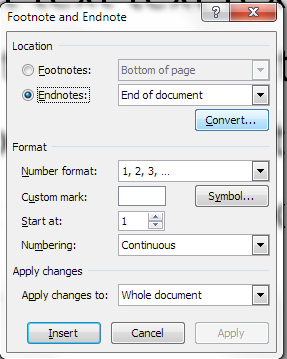 What are the endnote options? Here you can choose the number format, whether the endnotes appear at the end of each section (you will need to apply Section Breaks to make this work) or at the end of the whole document, and whether the numbering starts at the beginning of each new section or just runs through all of the document continuously. For more detail on these options, see the relevant sections in the article on Footnotes. How do I make the endnotes appear on a new page? To make your endnotes appear on a new page, simply add a Page Break before them by putting your cursor at the end of the main text and pressing Control-Enter. 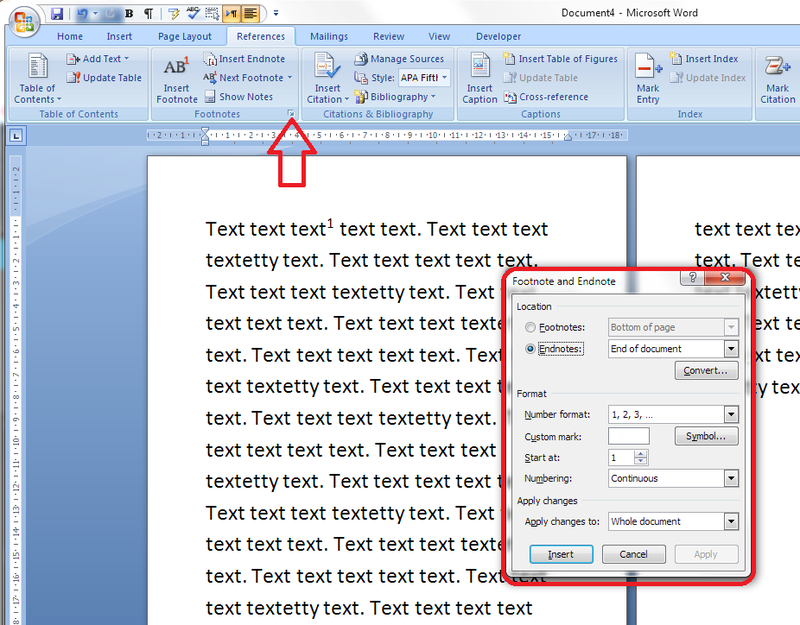 In Word 2003, you add endnotes using the Insert – Reference menus. The footnote options are then the same as above. In this article we’ve learnt what an endnote is, why you use them, all about inserting and deleting them and the options for customsing them.